CCCU. 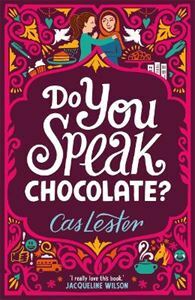 Do You Speak Chocolate? 'I just knew we were going to be friends. Don't ask me to explain why. Jaz is outgoing, rebellious, gumptious and a little bit bolshy - but it doesn't stop her from finding it hard that she doesn't have a best friend at school any more. Not since Lily went off with Kara ... She's not one to get down about things, though - and things start to look up when Nadima comes into their classroom. Before long the girls are firm friends, even when Nadima, recently arrived from Syria, can't speak much English. The path of true friendship doesn't run smooth, though ... Jaz, ever the entrepreneur, cooks up a plan to sell Turkish Delight at school, with disastrous results. A drama project with Nadima about family history proves impossible to manage. And Charity Challenge Week puts the icing on the cake as Jaz puts every foot wrong possible. Can she find a way to put things right, and restore the wonderful and unique friendship that she has with Nadima? In a story of friendship, family and entrepreneurial wizardry, Cas Lester deftly navigates the trials and tribulations of girlhood, and examines with the lightest of touches and gentle humour the thorny and compelling issues of integration, belonging and identity.